Vanish for blood stains – amazing, it actually really works! I recently accepted to publish a sponsored press release via My Scoop for Vanish Power O2 Powder on how to remove blood stains. This subject was of particular interest to me, not that I have a secret life in the mafia but my 6-year-old son suffers terrible nose bleeds, often at night and it ruins his bed linen. 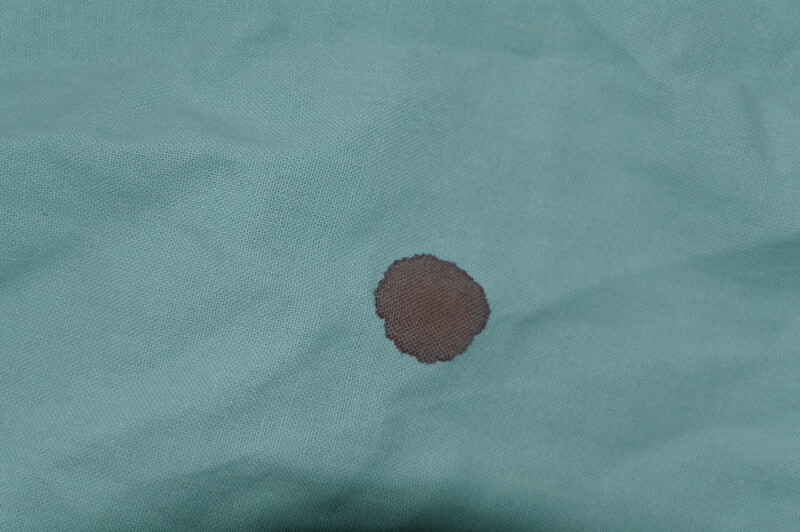 All of his sheets, pillow slips and duvet covers have old blood stains on them. I thought that I may try it some time but was not in a hurry to rush out and buy it. I published the press release with instructions on how to remove blood stains but then had a niggle of conscience, what if it doesn’t work? Then I should not promote the product. Nothing must compromise my integrity. I have never used Vanish Power O2 powder. I have used Vanish Power O2 pre-wash spray but to be honest I thought that nothing would completely remove blood stains. I have tried the spray and left it for 5 mins before washing but at best the blood stain faded. 3 Nights ago Fjord had a nose bleed again (we have now bought a humidifier which we hope will help him.) I did not wash the sheet on the day as I had decided that I must test the powder, today I went shopping and bought a tub of Vanish Power O2 powder. I was reminded why I have never bought it before, it’s expensive, R70 for a 500g tub and the scoop is so huge, I don’t see it going very far. None the less I was committed to this course and went ahead. At the back of my mind I still didn’t expect it to really work, at best I thought that maybe it would work a bit. What’s more the stain had remained unwashed for 3 days, well and truly set. I followed the instructions on the press release, first gave the stain a very half-hearted wash with laundry soap and cold water by hand then left it to soak in the mix of Vanish. I didn’t look for the stain after soaking but stuck it straight in the washing machine, I tipped the water & Vanish which it had been soaking in into my top loader and ran a wash cycle, I don’t even use fancy commercial detergents, I make my own using grated laundry soap. I didn’t even add more Vanish to the wash, (I’m being frugal with this stuff.) When I went to hang up the sheet I was gobsmacked, the stain is gone, gone, gone, not a trace of it. No point in posting an ‘after’ picture I have no idea where it was. I can now happily accept payment for the press release and be delighted to share this with anyone else looking for a real solution to getting rid of blood stains on fabric, Vanish Power O2 honestly is the answer. Well I’m pleased for you but Vanish sure as hell doesn’t remove blood stains for me, despite following the instructions to the letter. Despite pre treating, soaking and washing with a large scoop in the washer and doing all of this twice the stain is still there and very very visible just a dull toffee brown. Oh dear, that’s a pity. I wonder if different fabrics retain a stain more. Mine were on cotton sheets, I’m not an expert just wondering.